After Helen Parr (Holly Hunter) is selected to join a mission to bring superheroes back, her husband, Bob (Craig T. Nelson), is left at home to manage their three children - Violet, Dash and baby Jack-Jack - and the family’s day-to-day life. When a new villain hatches a brilliant and dangerous plot, the family - together with Frozone (Samuel L. Jackson) - must find a way to work together and save the day once again. Following a long (14 year) wait, Incredibles 2 has arrived. Finally, amid a near constant stream of franchises and spin-offs, here is a sequel that we actually want. The question is, can director, Brad Bird, deliver a film worthy of the much beloved original? Or is this a case of too little, too late? Yes this is a sequel worthy of (although not quite as good as) Pixar’s 2004 original animated classic. 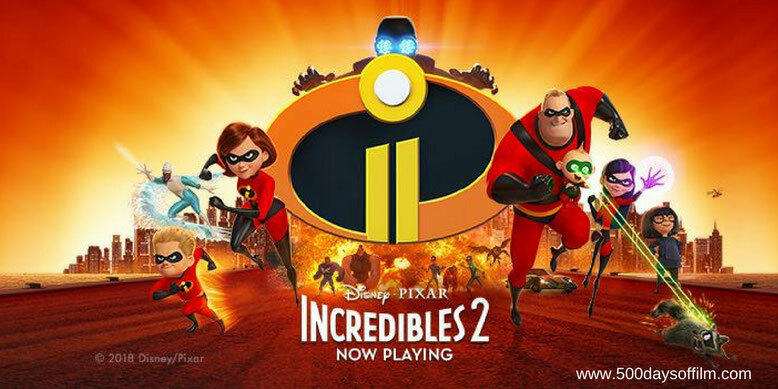 Incredibles 2 delivers a timely, thought provoking story wrapped up in just under two hours of non-stop action and adventure. And, no, this is definitely not a case of too little, too late. Incredibles 2 is well worth waiting for. The excitement (and stunning, almost photo-realistic animation) begins minutes after The Incredibles concludes. The supers remain illegal - wrestling with their need to save the day and their desire to obey the law (a conflict that makes for fascinating Parr dinner table debate). These themes - so fresh 14 years ago - have now, of course, been explored countless times in countless superhero movies. However, they feel fresh in Incredibles 2 - particularly as they give Helen Parr (aka Elastigirl) the opportunity to shine. And, wonderfully voiced by Holly Hunter, shine she most certainly does. Helen is chosen to lead the charge for a change in superhero law. She joins a super-friendly corporation determined to show the world that supers are a force for good and should be legalised. Meanwhile, as Elastigirl relishes her freedom, Bob Parr (another great vocal performance from Craig T. Nelson) is left holding the baby... literally. It’s Mr Incredible versus a challenging life of domesticity. Violet and Dash each have their own issues but baby Jack-Jack steals the show. The sequences exploring his newfound powers are brilliant - hilarious moments of slapstick genius (particularly the scenes featuring a rather feisty racoon). Nothing comes close to eclipsing Jack-Jack, even the film’s main villain - the evil Screenslaver. Pixar is, of course, renowned for exploring topical issues that concern families the world over. Incredibles 2 is no different - the film examines our over reliance on screens. Again it’s not quite as powerful as the original, but feels important and relevant nonetheless. Indeed, the film’s message inspired a number of parents at my screening to warn their children not to expect unlimited screen time. Incredibles 2 is a wonderful and exciting sequel to a film that we have loved for 14 years. This movie was definitely worth the wait - and it left me wanting more. I loved the return of Edna Mode (voiced by Brad Bird). Incredibles 2 is preceded by a poignant (and rather shocking) Pixar short film called Bao. Directed by Domee Shi (the first female director of a Pixar short), the story follows a dumpling that comes to life. If you have, what did you think of Brad Bird’s sequel? Let me know… leave me a comment in the comments section below or let’s discuss the movie over on Twitter. You can find me @500DaysOfFilm. I agree this was well worth the wait. I had a great time watching it for all the reasons you gave, and more. Thank you for reading! I hope that we don't have to wait another 14 years until the next one... I really think we deserve a triology! I'll be there for it!